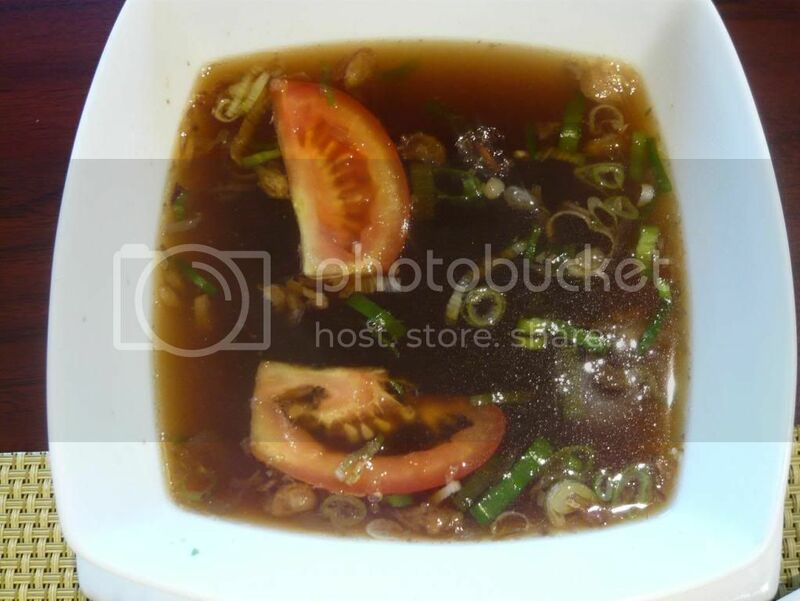 Who's calling this ox tail soup legendary? I didn't start it, for sure. By the time I was enjoying food, Hotel Borobudur was already known for their "legendary oxtail soup." 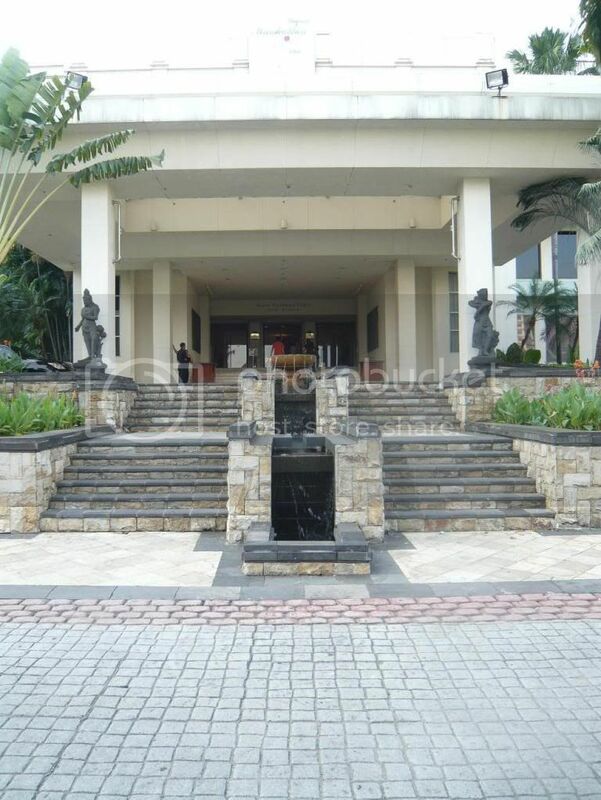 The claim makes sense historically, as Hotel Borobudur is the first five star hotel in Indonesia. Being a 5-star hotel and all, the ox tail soup costs a ridiculous Rp. 150,000, which is a whopping $15. Well, putting it that way it seems affordable to try, so we went. We had a super early dinner because my parents had to fly back to Surabaya around 6 pm. When we got there we realized we're missing both the lunch and dinner buffet! The dinner buffet would've cost $25 and came with all the ox tail soup you want, along with crab and other goodies. Dammit. 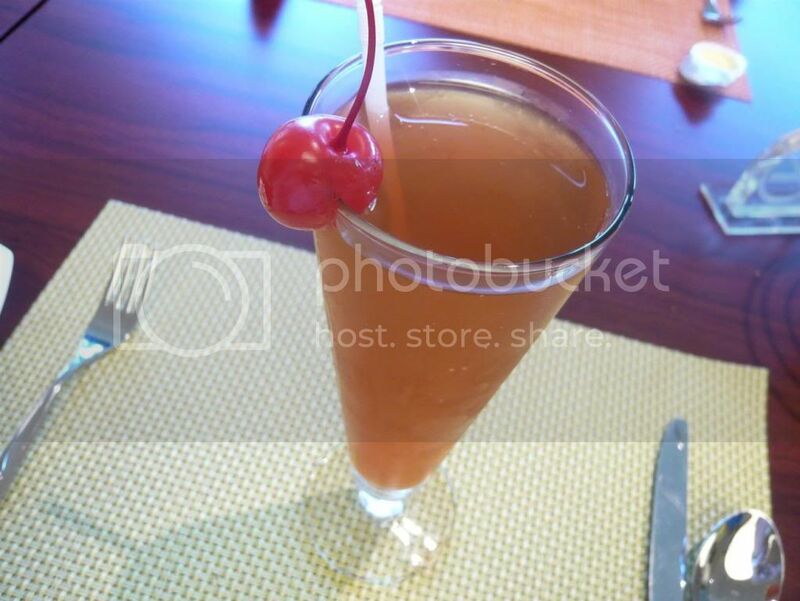 Besides your typical soft drinks, Hotel Borobudur also offers a couple of traditional drinks, one of them being a jamu which is said to be the favorite of an old king from Jogjakarta. Jamu is the medicinal herbal drink of Indonesia and its variety spans as many as the herbs you might think of to put in it. This jamu is actually sweet and refreshing, without that medicinal funk at all. We all got, of course, the ox tail soup. 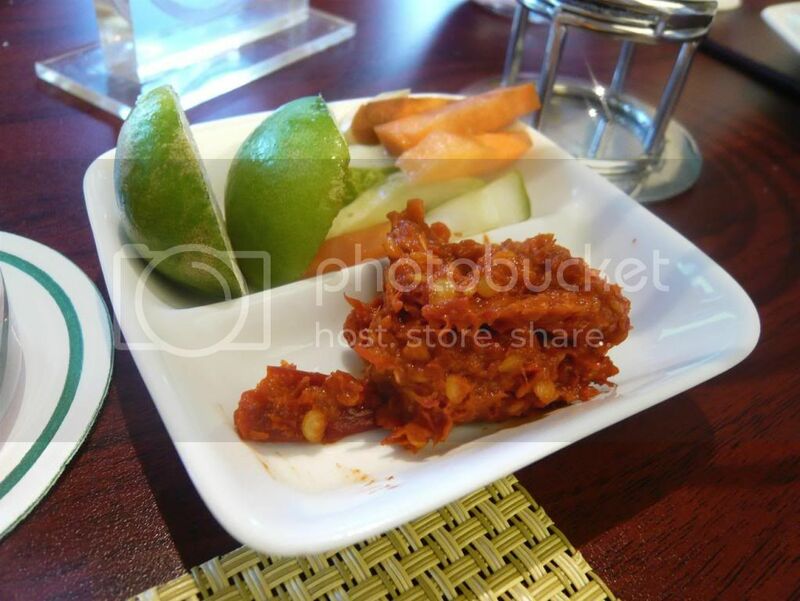 But Hotel Borobudur offers three types of sop buntut: the original, fried, or bbq. The verdict of the day: get the original. 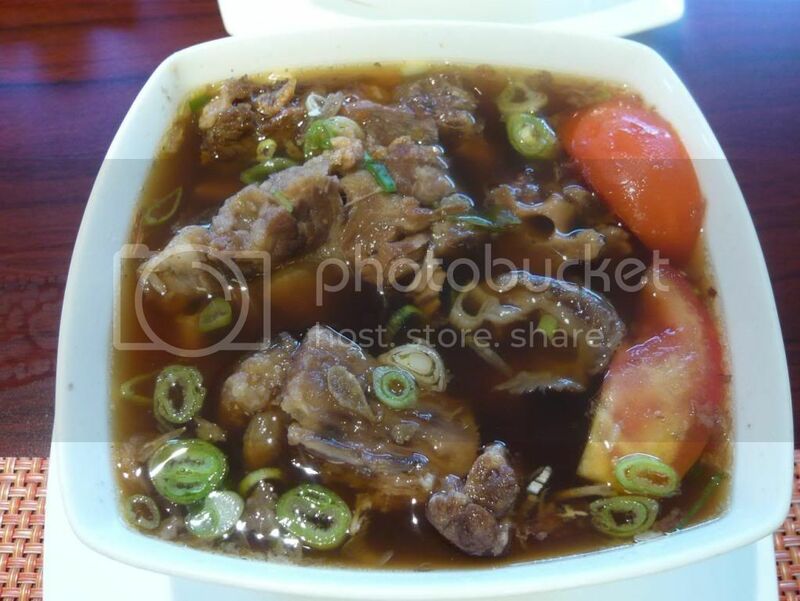 The oxtail meat in the original soup is much more tender and the soup as a whole retains more of the meat flavor. For the fried and the barbequed, the meat is served dry, separated from the broth. 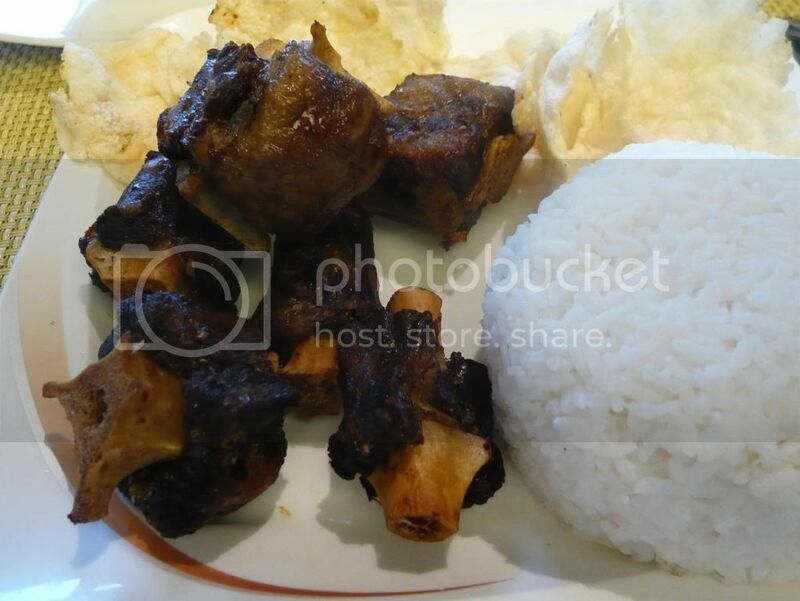 The oxtail meat is tougher in this case and having them fried or with bbq sauce on top didn't add much for me and did not compensate for the loss of the meat's tenderness. Everything is of course served with a side of appropriate condiments - in this case lime to squeeze into the soup, pickled vegetables, and a dollop of chili sauce. Add to taste. The questions "was it worth $15?" and "was it worth Rp. 150,000?" are completely different, even if the two monetary values are equivalent. In the latter case, probably not. If you're curious in trying this legendary oxtail soup, though, you should probably go for the buffet. That seemed worth the money. aaah! this oxtail wasn't THAT much greater than rest...your mom's was better! ha ha.